No. 84. Precast Insulated Sandwich Panels. During the mid-20th century, with the rise of industrial prefabrication, precast concrete sandwich panels started being used as cladding for buildings. Since then, society and construction industry have become increasingly aware of energy efficiency in all fields, including affordability and sustainability consciousness, while maintaining the buildings’ durability. As such, buildings have been subject to increasingly stringent requirements which has kept the technology of sandwich panels continually at the forefront of building envelope evolution. Nowadays, sandwich panels have reached the highest standards of functional performance and aesthetic appeal. In building construction, these sandwich panel attributes combine with the well-known advantages of prefabrication including structural efficiency, flexibility in use, speed of construction, quality consciousness, durability, and sustainability. Sandwich panels have gained more exposure, thus representing quite a significant application within the prefabrication industry and a vital component of the precast market. The fib Commission “Prefabrication” is eager to promote the development of all precast structural concrete products and to share the knowledge and experience gained, to aid with practical design and construction. By issuing this comprehensive overview, “Guide to Good Practice”, a better understanding of design considerations, structural analysis, building physics, use of materials, manufacturing methods, equipment usage and field performance will be provided. This document contains the latest information currently available worldwide. The Commission is particularly proud that this document is a result of close cooperation with PCI and that it is published by both the fib and PCI. This cooperation started six years ago, first with comparing the different approaches to several issues, then progressively integrating and producing common documents, like this one, that hasn’t yet been treated in a specific Guide by either body. 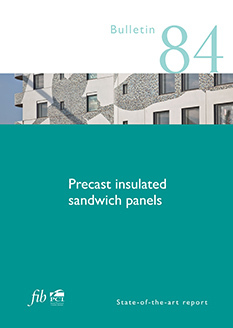 This Guide is intended to be the reference document to all who are interested in utilising the advantages of Precast Sandwich wall panels. In conjunction with the previously published Planning and Design Handbook on Precast Building Structures, the designer will have significant resources to integrate sandwich wall panels into any applicable structure. The Commission is grateful to all the Task Group members for this accomplishment, particularly to Simon Hughes, who convened and led it successfully.